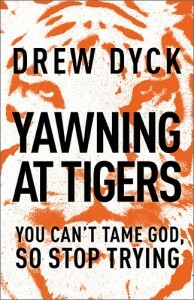 The newly-released book Yawning at Tigers by Drew Dyck (Thomas Nelson Publishers) reaffirms a reverence for God and explores the topic of holiness in particular. Dyck, managing editor of Christianity Today’s Leadership Journal, recently explained some of the inspiration for the new release to White Wing Messenger Managing Editor DeWayne Hamby. This is a serious topic and one that seems largely overlooked, the reverence and holiness of God. What inspired you to explore it? I worried we were losing sight of God’s holiness. Listening to the language we use in evangelical circles is what tipped me off. We love talking about God’s love, but we don’t talk much about his holiness. Most of our worship choruses could be sung to God—or a girlfriend. Sermons drip with assurances of God’s affection but rarely seem to mention his holiness, let alone his wrath. Don’t get me wrong—we need to be reminded of God’s love. But something is missing. That’s what inspired me to write the book. Why do you think the idea of God-as-cosmic-buddy has been so popular in the church today? We live in a therapeutic culture and we relate to God increasingly on therapeutic terms. Since many people find God’s majesty and holiness disconcerting, we gloss over those attributes and focus exclusively on love. Unfortunately the love of a cosmic buddy or divine therapist doesn’t mean much. But the love of the Lord of heaven and earth, the one who Isaiah says, “dwells in unapproachable light,” that’s something else entirely. How does restoring his holiness affect our own ideas of personal holiness? Our view of God’s holiness has a direct impact on our holiness. I think we have a huge problem with holiness in the church. There’s been a reaction against the fundamentalism of yesteryear by swinging the pendulum too far in the opposite direction. So we have a whole generation that sees the pursuit of holiness as optional or even legalistic. Why this confusion on a basic Christian teaching? We lack a practice of personal holiness because we’ve lost a theology of divine holiness. When we neglect a part of God’s nature, we shouldn’t be surprised when that same attribute goes missing in our lives. You use a tiger as a metaphor for the nature of God. Can you summarize that for our readers? Tigers are beautiful and dangerous. We’re drawn to them—and it isn’t because they’re cute and cuddly. It’s because they’re fearsome and dangerous. Those are the qualities that make them so fascinating. I think it’s a little like that with God. A God who isn’t dangerous doesn’t capture our imagination, doesn’t inspire worship. Unfortunately I believe many of us are numb to this aspect of God and desperately need to rediscover a dangerous God. What is your hope that readers will take away from this book?